"Forget it! I'm stayin' put, right where I am. It's gonna take you and the police department and the fire department and the National Guard to get me outta here!" Back in 1978, the real "Norma Rae" (Crystal Lee Jordan) did for the southern textile mill workers what Erin Brockovich did for PG&E's victims in Hinkley, California. Her courage caught the eye of 2 young Hollywood producers who made it their obsession to tell the stories of these blue-collar workers and the people who championed their plight. 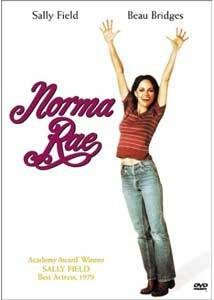 The title character of Norma Rae is an amalgamation of small town women who risked everything for a better life. After many actresses turned down the role (including three that would later vie against her for that year's Oscar®), long-shot Sally Field plays the single mother who spends her days in the relentless, deafening din of a cotton factory, working the looms in numbing repetition alongside her mother and just about every other soul in her Alabama milltown. Drinking beer and sleeping around is about the only relief available, and Norma Rae is determined to have relief. Sonny: Damn TV dinners, kids goin' around in dirty jeans... I'm going around - without - altogether! Norma Rae: You want cookin'? You got cookin'. You want laundry? You got laundry. You want ironin'? You got ironin'. You wanna make love? Then you get behind me and lift up my nightie and we're gonna make love! In the late 1970s, trying to pitch an unglamorous story that seemed like "Gidget Goes to Work" was an uphill battle itself. Sally Field, too, had her own sort of battle, trying to shake her teen idol image and make the move to more serious roles on the big screen. With her earnest and believable portrayal, she won the respect of her peers who presented her with cinema's Triple Crown: the Oscar®, Golden Globe and Cannes awards for best actress. Liebman could not be more natural in his role, and Beau Bridges seems to grow along with his character. Director Ritt treats his story as a documentary, weaving every element together into one continuous bolt of cloth. Only two decades later, Norma Rae stands as a historic reminder of conditions in our all-too-recent past. But it also serves to remind that organizers, represented here by Reuben Warshawsky, still risk their own safety to introduce union concepts to hesitant workers all over the world. One willful woman's struggle that leads 800 workers to stand up for their rights against oppressive conditions is larger than the O.P. Henley textile mill in one small southern town. This story is both intimate and universal, and continues to drive its message home. Image Transfer Review: Norma Rae was originally filmed using hand-held cameras under mostly ambient lighting for a more natural, documentary-style effect. As a result, the source itself is soft and grainy with varying contrast. The transfer captures all of these flaws without emphasizing them, so I applaud Fox for successfully translating the director's vision. Audio Transfer Review: The 2.0 surround is about as much of an audio track as one would want from this disc. For the duration of the film, we live with the deafening noise level of that factory, and the whirrs and clattering and indistinguishable din stays with you long past the end. Even with this damaging racket, dialogue is always clear and comprehensible. For full impact, I recommend the 2.0; any further viewings, you might choose the original mono to save your ears, but the dialogue, of course, flattens as well. A French mono track and time-edited subtitles in English and Spanish are available. Extras Review: Fox provides a widescreen theatrical trailer and the AMC documentary, Backstory: Norma Rae (23m:48s). Field, Liebman and co-producer Tamara Asseyev participate and share their memories, most notably of working with the once blacklisted director, Martin Ritt. Fox includes their Fox Flicks trailers for 9 to 5, For the Boys, Nine Months, The Truth About Cats and Dogs and Working Girl. Surprisingly fresh and inspiring after 20 years, Sally Field's performance as the vulnerable and courageous Norma Rae will still liberate your spirit. A didactic story that should be on the "must see" list for generations to come.